Our experienced team at Master Aluminum works to provide you with the best quality decorative storm shutters in Jacksonville at affordable wholesale pricing. Our manufacturing team produces state-of-the-art seamless welded frames to support the structure of our shutters. We then harness the latest design techniques to ensure that each product we build is designed for unparalleled aesthetic value. In each area of production at Master Aluminum, we adopt the latest technology. This gives us a competitive edge in various areas of the marketplace. One particular area is in the powder coating of our shutters. We use a digital mil gauge to monitor the thickness of the coating to guarantee uniform quality. Inconsistencies within the process are immediately repainted if required. A leading benefit of turning to Master Aluminum is that we offer some of the fastest turnaround times in the industry today. Very few companies can match our team at speed of production and working efficiency. We can now expedite orders in just a few days thanks to our in-house capabilities. Because we provide accurate data within our shipping forecasts, we can help suppliers schedule their shipments more effectively, thereby limiting issues with product access and ensuring their customers receive the best quality shutters on time. One of the most common issues our clients face is finding decorative aluminum shutters that not only have supreme aesthetic value but also offer durable performance over many years. Because of our ability to work with the latest manufacturing technology and the many years we spent building a purpose-fit facility, we can respond to the demands in the marketplace for durability and style with a premier selection of quality shutter products. With its sturdy framing and classic design style, the Foil Blade Bahama Shutter is one of the finest products across the marketplace. The product is designed for flexible performance and providing ample shade for the home. The Z-Blade model features the use of more frequent center mullion space to allow for effective performance throughout the home. The Z-blade lower extrusion is made from 063-T6 aluminum with a uniform wall thickness of .062. The blades feature a single wall with angled ends that form a Z-shape. 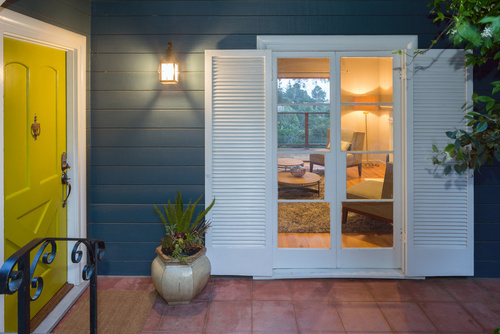 Widely considered one of the strongest shutters in the marketplace outside of the storm-rated shutter range, the Board and Batten Colonial Shutter is a great option for those seeking decorative storm shutters in Jacksonville. The product is also offered in many variations, including triple battens for extra tall windows and cross battens for superior durability. Usually placed over a wall where there is no window, the frame for the Arched Foil Blade Panel is made by running the frame through a roll bending machine. The panel is then cut to the same radius as the frame, and then the frame is attached to the panel to achieve the appeal of a one-piece system with an arched aesthetic. The Arched Board and Batten shutters are primarily designed to match the B&B Colonial shutters when the property has a window with an arch. One of the unique benefits of working with Master Aluminum for Arched Board and Batten Shutters is we offer the products in various configurations for exceptional value in the modern home. Whether you’re a supplier of decorative, quality storm shutters to the Jacksonville marketplace or a homeowner seeking the best value options for your property, we can provide you decorative shutters that set the standards for performance and economic value. We have over 30 years of experience within the shutter manufacturing marketplace, and this experience means we can respond to unique requirements on short notice. Our team is immensely proud of the work we complete for our clients throughout the region. We’re available around the clock to answer your questions and help you choose the best shutters for your applications. To learn more about our company and the full range of decorative storm shutters we offer to clients across Jacksonville, call us today at 727-725-1744.